This is a thread to discuss the Frisian tribe's models. The building textures are very dark, as has been mentioned before. We need to find some better textures. This one looks pretty good for brick: http://www.photos-public-domain.com/2011/01/04/red-brick-wall-texture/ the have good stuff in the walls category, and it's all Public Domain/CC0, so we can use them. They also have wood: http://www.photos-public-domain.com/?s=wooden+wall. For the roofs, we could use the new Barbarian textures (used e.g. by the Wood Hardener). Maybe also give the wooden walls a hint of player color, like in Scandinavian houses? Here´s a first experiment with the brick wall texture, and a lighter roof and floor. What do you think? The one thing I don´t like about this texture is that the bricks don´t blend very well at the edges. I don´t want to use wooden walls, as this is really atypical in frisian architecture. But many frisian houses (in olden times especially rich captain´s houses) have white (or rarely red) paint over the walls, with the brick structure clearly visible beneath. I´m also experimenting with that. We could for example have houses with various brick structures and some with white paint, and more variation in the playercolor patterns around window frames. For the roofs, we could use the new Barbarian textures (used e.g. by the Wood Hardener). I´ve been using the texture from graphics/stock_sources/blender_resources/Materials/textures/Tathced_toof2.jpg in the media repo, is there another one? I think experimenting with paint is a good idea, it will help make each building more unique and distinguishable. I have no idea - I didn't find anything else in that folder. You could have a look at the current models themselves and try to extract the texture from there. "Broadsword" with a new image would work. So maybe it could be interesting to rename the double edged sword as well, for example to "Two-handed sword", "Elite Sword", "Warrior Sword" or "Big sword"? I put two whitish paint-like textures over the tavern´s brickwall to get a white wall with the bricks shining through. The furnace´s walls are smeared with smoke-like grey. 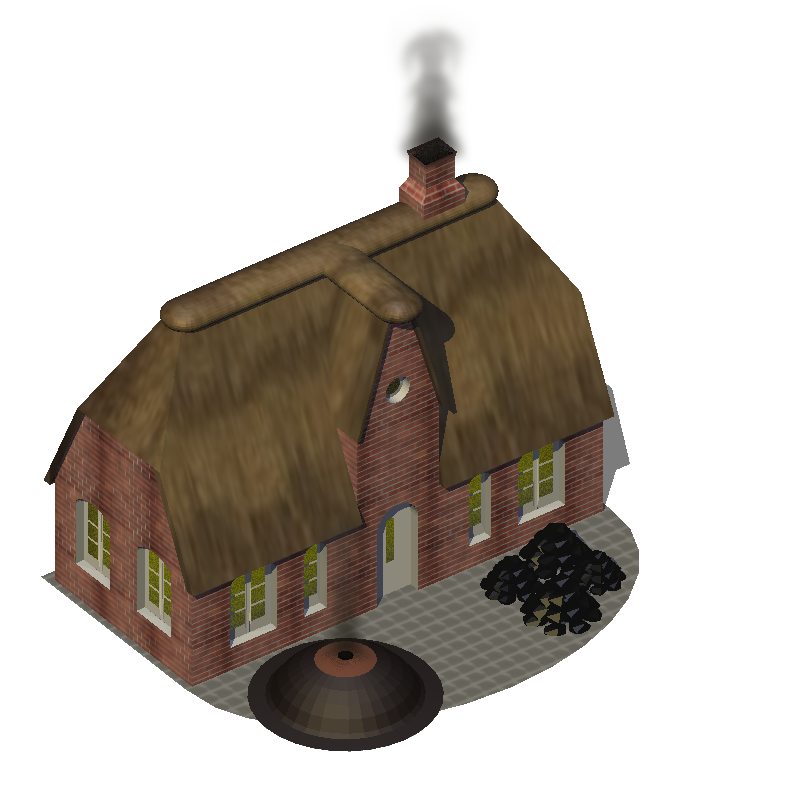 The unoccupied buildings have "newer" bricks and freshly thatched (=lighter-coloured) roofs. By the way, the new furnace has two different working animations, one for smelting iron and the other when smelting gold. While you are on the buildings, can you try to make the windows not that off-standing? If you have the time, it would also be great to give the roofs some thickness at the bottom. We also need a grass texture for the headquarters and military buildings. I completed a new charcoal kiln now. This one has it all: Slightly smoky walls like the furnace, a lighter roof, windows that are lowered into the walls instead of standing off, thick roofs at the edges and bottoms, and less cartoonish window lighting. 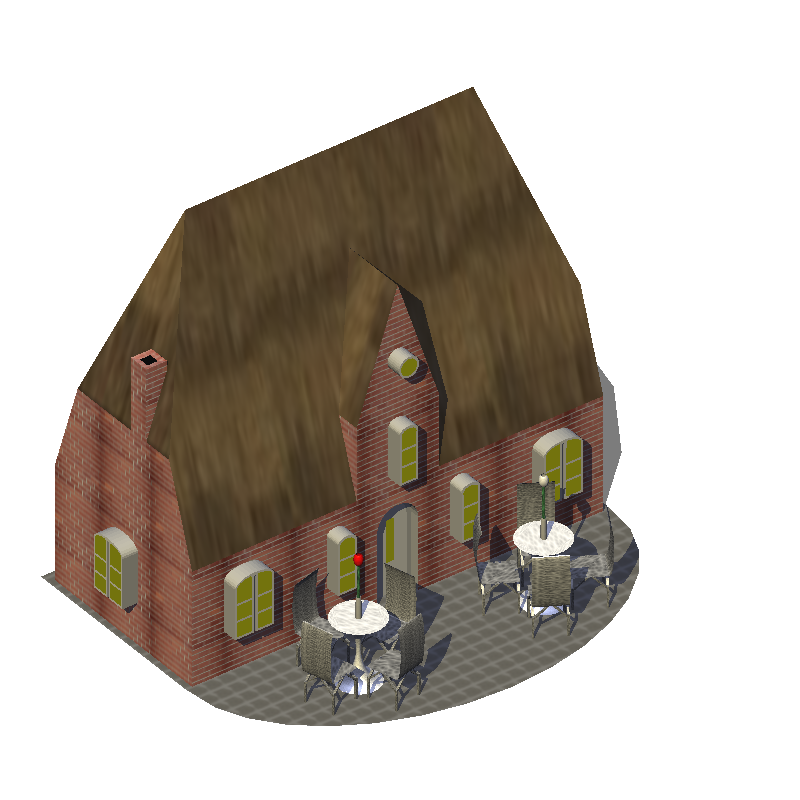 It´s a lot of work though, especially the lowered windows and the roof edges, and the rendering time is long. I can´t guarantee all buildings will be ready for build 20.